Making your own cutting board can be a fun and rewarding process, and If you've been looking into how to make a cutting board, you've spent some time looking for quality hardwood. Hardwoods however can be difficult to purchase in small quantities, and you may not have all the necessary tools. With Sj WoodWorks DIY Cutting Board Kit, you can purchase several small species of both domestic and exotic hardwoods, all FSC certified, and already cut to a perfect size for your cutting board project. 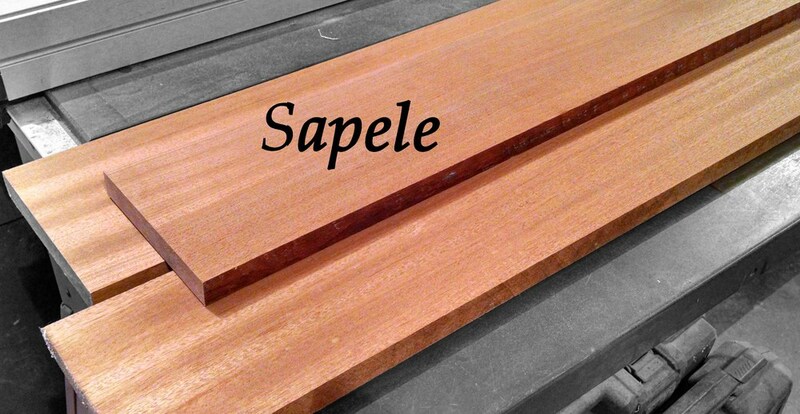 Each piece is cut to be 1-3/8"x13/16" and comes in both 12" and 18" lengths. Stand each piece up to make a thick 1-3/8" thick cutting board, or lay them flat to create a 13/16" thick bread board. After each piece is planed and cut, all four faces are run through a drum sander, giving you four glue ready edges. Combine as many as you like to create the cutting board you've been dreaming of. All you need to do is glue, clamp and sand. It doesn't need to stop with a cutting board though, use this DIY Cutting Board Kit to create anything you can imagine. Many other species are available. Don't see what your looking for? Just ask! Don't forget to add a bottle of SJ's Board Butter to help keep your creation looking great! This kit includes 16 pieces of hardwood. Each piece = 1-3/8" x 13/16" x 18"
Select Wood Species & Length Rustic Hard Maple 18"Hard Maple 18"African Mahogany (Sapele) 18"Black Walnut 18"Purpleheart 18"Rustic Hard Maple 12" Hard Maple 12"African Mahogany (Sapele) 12"Black Walnut 12"Purpleheart 12"
Add SJ's Board Butter, to keep your creation looking great! Please note that some pieces may contain natural imperfections such as knots, variances in grain coloration, or possibly some checking. These imperfections are natural, and help add to the uniqueness of your project. All lumber is kiln dried to about 6%, and cut, planed, and sanded straight. However, due to humidity changes during transit, it is possible that some pieces may experience movement and develop a warp or bend. Again, this is a natural occurrence of wood, and SJ WoodWorks cannot be held responsible for any damage. warping, or bending that takes place once the order leaves the shop. As is always the case when buying lumber, it is wise to order slightly more than you think you need.